16th July 1723, Plympton, Devon, England. Joshua Reynolds was the seventh child of ten (or eleven children) of the Reverend Samuel Reynolds, Master of Plympton Grammar School and his wife Theophila. Plympton Grammar School. 1740 went to London to be apprenticed to Thomas Hudson, the son-in-law and a pupil of Richardson. 1740: Reynolds starts an apprenticeship with Thomas Hudson, the fashionable portrait painter in London. 1743: Ends his apprenticeship after a quarrel with his master. 1747: He paints a self-portrait. 1749: Reynolds becomes friends with Augustus Keppel a naval officer and goes to Portugal, Spain and Minorca and on to Italy. 1750: Arrives in Rome. He suffered from a severe cold which made him partially deaf and he had to use an ear trumpet for the rest of his life. 1752: Reynolds starts the Journey home and stays in Paris on way and brings Giuseppe Marchi with him as his assistant. 1753: He finds a house in St Martin’s Lane, London. 1757: Reynolds paints a Self Portrait. 1759: Charges 100 Guineas for one of his full length portrait paintings. 1760: Takes up residence in number 47 Leicester Square London where he establishes a large studio. Exhibits at the first Annual Exhibition of the Society of Arts. 1764: Foundation of the Literary Club (later known just as “The Club”) with Samuel Johnson and others. Meetings are held at the Turks Head public house in Gerrard Street. 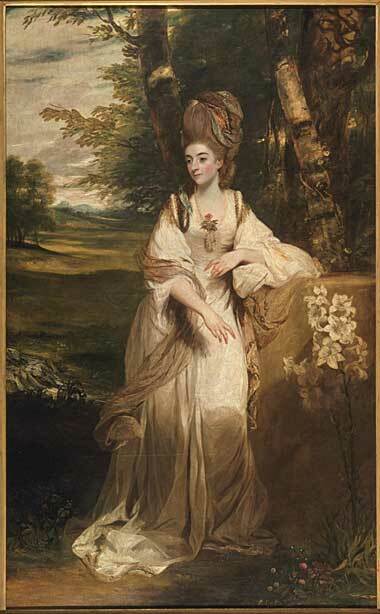 1765: Reynolds prices have now risen to 150 guineas for a full-length portrait. 1768: He is elected as the first President of the Royal Academy of Arts. Visits Paris again. 1769: Gives the first of his discourses on art at the Academy in January. The first Annual Exhibition is held. Reynolds received his Knighthood from King George 111. 1771: Visits Paris once more. 1772: Reynolds is elected as an Alderman of the Borough of Plympton. Paints a portrait of Oliver Goldsmith. 1773: Given a Doctorate by the University of Oxford in Civil Law. He is elected as Mayor of Plympton. 1774: Charles James Fox becomes a member of the club. 1775: He is elected a Member of the Academy of Florence. 1779: Paints a portrait of Edward Gibbon. 1780: The Royal Academy of Art moves into new premises on the Strand. Painted a view of Richmond Hill. Although he was famous for portrait painting and was to complete over three thousand in his lifetime he also worked on landscapes. 1781: Reynolds goes on a tour of the Low Countries. 1783: Reynolds suffers a major inflammation of his eyes. 1784: He is appointed as Principal Painter in Ordinary to King George the Third after the death of Allan Ramsay. 1785: Makes a visit to Antwerp, Ghent and Brussels. 1787: Reynolds exhibits a portrait of Prince George in the Royal Academy exhibition. 1789: He loses the vision in one of his eyes. Makes a visit to the south coast for his health. Paints a portrait of Richard Brinsley Sheridan. 1790: Reynolds resigns as President of the Royal Academy of Arts, but withdraws his resignation a few months later. The General Assembly agreed to his re-instatement and appointed Benjamin West and Sir William Chambers to deputise for him when he was in ill health. Delivers the last of his discourses on art at the Academy. 1791: Loses most of his vision. 1778: First Seven Discourses on Art. 23rd February 1792, Leicester Fields, London, England. 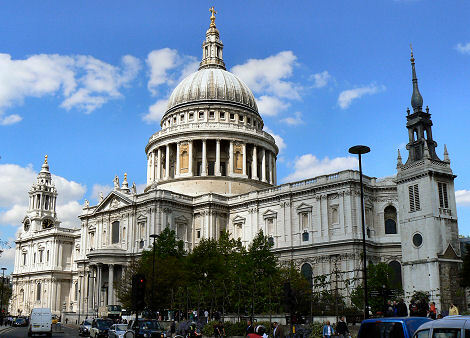 St. Paul’s Cathedral, London, England. AVON: Holbourne Museum, Bath. Victoria Art Gallery, Bath. Bristol City Art Gallery. BUCKINGHAMSHIRE: Ascot Racecourse CAMBRIGESHIRE: Pembroke College, Cambridge. Porters Hall, Trinity College, Cambridge. Elton Hall, Peterborough. DEVON: Saltham Park, Plymouth Royal Albert Memorial Museum, Exeter. City Museum and Art Gallery, Plymouth. ESSEX: Audley End, Saffron Walden. DURHAM: Bowes Museum, Durham. GLOUCESTERSHIRE: Sudeley Castle, Winchcombe. HAMPSHIRE: City Art Gallery, Southampton. HERTFORDSHIRE: Hatfield House, Hatfield. Woburn Abbey, Woburn. KENT: Knole, Sevenoaks. LANCASHIRE: Blackburn Art Gallery. LINCOLNSHIRE: Belvoir Castle, Grantham. Gunby Hall, Spilsby. Normandy Hall, Scunthorpe. 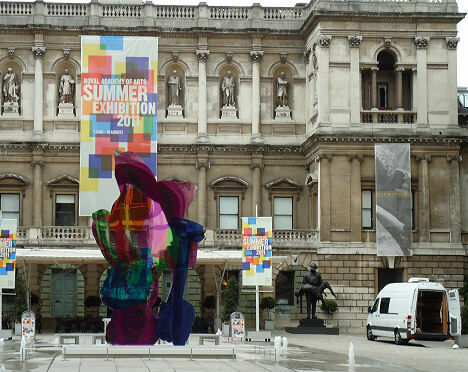 LONDON: The Royal Academy of Arts. (There is a statue of him outside as he was the RA’s first President). Dr Johnson’s House Museum. Geffreye Museum. National Portrait Gallery. Sir John Soanes Museum. Tate Britain. Wallace Collection. National Maritime Museum. Kenwood House. MERSEYDSIDE: Sudley House, Liverpool. MIDDLESEX: Ham House, Richmond. Marble Hill House, Twickenham. NORFOLK: Felbrigg Hall, Felbrigg, Norwich. Houghton Hall, Kings Lynn. NORTHUMBERLAND: Alnwick Castle, Alnwick. OXFORDSHIRE: Blenheim Palace, Woodstock. Buscot Park, Faringdon. Christchurch Picture Gallery, Oxford. Rousham House, Steeple Aston. STAFFORDSHIRE: Wedgwood Museum, Barlaston, Stoke on Trent. Shugborough Hall, Stafford. SUFFOLK: Manor House Museum, Bury St Edmunds. SURREY: Polesden Lacey, Dorking. SUSSEX: Arundel Castle. Art Gallery, Brighton. Goodwood House, Chichester. Petworth House, Petworth. TYNE AND WEAR: Laing Art Gallery, Newcastle. WARWICKSHIRE: Arbury Hall, Nuneaton. Ragley Hall, Alcester. Royal Shakespeare Company, Stratford on Avon. Upton House. WORCESTERSHIRE: Hagley Hall, Hagley. YORKSHIRE: Temple Newsam House, Leeds. Harewood House, Leeds. Cartwright Hall, Bradford. Branham Park, Wetherby. Beninbrough Hall, York. Castle Howard, York. SCOTLAND: Dalmony House, South Queensferry. Drumlanrig Castle, Dumfries. Floors Castle, Berwickshire. Fyvie Castle, Aberdeenshire. Hunterian Art Gallery, Glasgow. Museum and Art Gallery, Inverness. Scone Palace, Scone, Perth Scottish National Portrait Gallery, Edinburgh. WALES: School of Art Gallery, University of Wales, Aberystwyth. Powis Castle, Welshpool. NORTHERN IRELAND: Ulster Museum, Belfast.